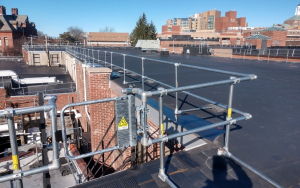 Our ladder accessories ensure that your existing ladders are used in compliance with OSHA standards. Ladder-Spurs prevent outward slip by increasing the base of your ladder and significantly reduces the chance of a sideways slip at the top. Secured easily and quickly with heavy duty ratchet straps, the independent spurs simply wrap around the ladder side rails. They can be attached at any height position to allow for sloping ground, and eliminate the need for someone to stabilized the base. 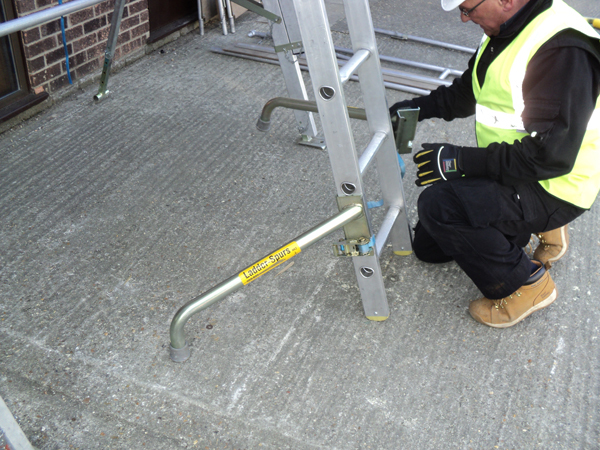 The Ladder Stand-Off incorporates a large 'V' which allows the ladder to span around downpipes or rest on the corners of buildings. The top of the ladder is kept 1ft off the wall, making it useful when working under eaves.